Food cravings are more than subtle desire. Unlike general hunger, cravings tend to be pronounced and specific. 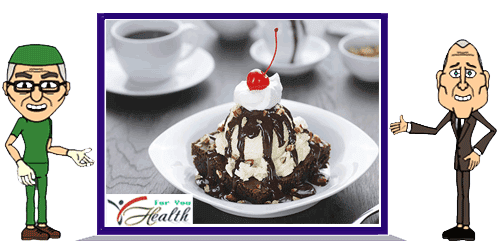 You don't just want sweets or a salty snack; you need a hot-fudge-brownie sundae or cheesy nachos at least that's how it feels. Occasional cravings and feeding them even if the foods aren't nutritious or reasonably portioned won't ruin a healthy diet. Habitual cravings and responsive eating, however, can pose problems. In severe cases, cravings and emotional eating contribute to depressive moods, heightened anxiety and stress, disordered eating habits and undesired weight gain. Rather than beat yourself up or stress over food cravings, which only makes matters worse, see them as tools for positive change. In doing so, you'll not only turn cravings into something helpful and less bothersome, you'll also experience fewer and less intense bouts over time. Cravings don't appear out of nowhere. When you get one, ask yourself why. Use the acronym HALT, which stands for "Hungry, Angry, Lonely, Tired." All of these feelings can send similar signals to your brain and body, which can then manifest as cravings. Are you actually hungry? If more than a few hours have passed since your last meal, you should probably eat. Has something happened that caused anger or frustration? Could you use some company or support? Attempting to cope with these feelings by eating is common, but it acts more like a short-term Band-Aid than a real solution. Seek out non-food ways to manage these emotions. Are you exhausted? If your brain and body need energy, your cravings could be demands for fuel. Consider taking a nap and see how that affects your craving. Once you understand why you're craving a particular food, the intensity may be less -- especially if you address the underlying issue head-on. Deal with your emotions by talking them out. Go for a walk, take a nap or eat a balanced meal or snack. Thirst is another "T" worth considering because it can also be mistaken for hunger. I'm not talking about a detailed food log that tracks your calories and fat grams; I'm talking about tracking your cravings. Record them in a journal when they arise, and be sure to include the date and time, what foods you crave, the intensity of the cravings and whether or not you plan to indulge them. Then dig deeper. Do you have any guesses as to why you're craving these foods? This would be a great time to put HALT to the test. Over time, you'll see patterns in your log. That self-awareness is powerful. If you have difficulty managing emotional factors, discuss your journal with a trusted loved one or therapist. Food cravings can also reveal nutrient deficiencies. If you're eating too few carbohydrates -- your brain and body's main fuel source you'll likely crave dense sources of carbs. If you eat a strict vegetarian diet or have heavy periods, you're at risk for an iron deficiency. Craving meat is a potential sign of low iron levels. A journal can come in handy here as well. Track your overall food intake and your cravings to go over on your own or with a qualified professional, such as a registered dietitian. Find healthy ways to increase levels of nutrients or foods you may be lacking to stay healthy while staving off cravings in the process.